Form, Line, Color, & Value: Qualities Abound in American & European Works of Art Auction at Skinner, May 19 | Skinner Inc.
BOSTON, MA – Skinner, Inc. will present an impressive selection of American & European Works of Art at auction on Friday, May 19. The day will be divided into two parts: Fine Prints & Photographs at 12PM and Fine Paintings & Sculpture at 4PM. 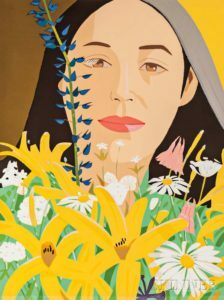 The auction offers an extensive variety of paintings, sculpture, prints, photographs, and works on paper ranging from Old Master prints through Modern and Contemporary offerings. The variety of prints is impressive, with multiple examples by such notable figures in 20th century art as Childe Hassam, Pablo Picasso, Alex Katz, Thomas Hart Benton, Romare Bearden, Marc Chagall, and Robert Motherwell. The auction offers a broad range of subject matter, time, and geography. 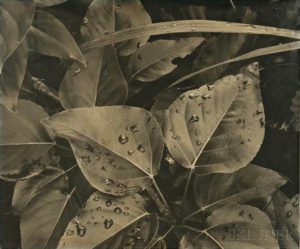 There are works by American icons Edward Curtis and Edward Steichen, examples from French, Swiss, Cuban, and Canadian photographers, and prints dating from the 1850s to the 2000s. Conversely, Walker Evans found beauty in very different subject matter. In a still life series made in the 1960s, Evans explored the debris on New York streets in eloquent close-ups (New York City Gutter, Lot 150, $3,000-5,000). Images range from the exotic, John Beasley Greene’s 1850s salt print of View of Terrain near Gebel Abousir, Second Cataract, Egypt (Lot 124, $2,000-3,000), to the glamorous, Edward Steichen’s studio portrait of Florence Meyer Homolka (Lot 139, $3,000-5,000), to the bizarre, Philippe Halsman’s Marilyn/Mao (Lot, 145 $800-1,200). Contemporary photography is well represented with images by Edward Burtynsky, Abelardo Morell, Tseng Kwong Chi, John Coplans, and William Wegman. 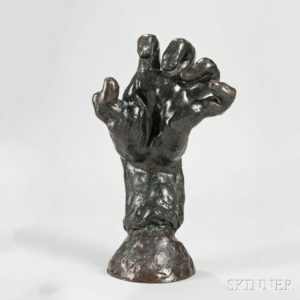 Leading the auction is Auguste Rodin’s Grande Main Crispée Gauche (Large Clenched Left Hand) (Lot 301, $120,000-180,000) originally modeled circa 1885, possibly as a study, later rejected, for his great sculpture The Burghers of Calais. This bronze exemplifies Rodin’s intense interest in the ability of hands to express a range of profound emotions. Another standout sculpture is Alexander Calder’s Untitled (Standing Mobile), c. 1953 (Lot 525, $100,000-150,000) and at only 3 inches high, displays the engineering skill, artistic genius and wit for which Calder is renowned. Paul Revere, (Lot 294, $20,000-40,000) is a Cyrus Dallin sculpture of the Revolutionary War patriot. The 21-year-old Dallin won a competition for a monument to Revere to be placed near Boston’s historic Old North Church. He made seven different versions over many years. This bronze is one of only twelve made from an original plaster of the 1899 version in the Museum of Fine Arts, Boston. Native-American themed pieces by contemporary sculptors Metz Castleberry and Dave McGary are dynamic examples of a rich tradition best known through the work of Frederic Remington, represented in this auction by Sergeant, 1904 (Lot 293, $4,000-6,000). 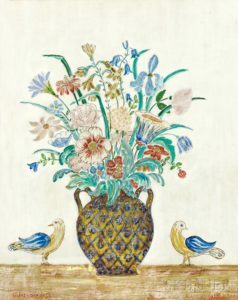 Chosen for the catalog cover is Charles Prendergast’s Untitled (Vase with Flowers and Birds), 1936 (Lot 382, $30,000-50,000). Rendered in tempera and gold leaf on an incised gessoed panel, the medium recalls the early Italian works that Prendergast admired. The style and subject matter are much influenced by American folk art, which Prendergast helped to popularize in the first half of the 20th century. Portraits and figure studies are especially well represented. Examples range from Thomas Hudson’s mid-18th-century formal portraits of British gentry, Mr. and Mrs. James Hilhouse (Lot 211, $20,000-30,000) to American artist Esperanza Gabay’s relaxed 1920 Woman Knitting in a Sunlit Bedroom (Lot 410, $15,000-20,000). A collection of post-impressionist drawings from the estate of Elaine Sargent is another significant component of this auction, with examples from such well-known artists as Edouard Vuillard, Raoul Dufy, Pierre Bonnard, and others. This entry was posted in News and tagged Alex Katz, Alexander Calder, American art, Andy Warhol, Ansel Adams, art, auction, Auguste Rodin, boston, Charles Prendergast, Contemporary Art, european art, fine art, fine art auction, fine photographs, modern art, Photography, Robert Rauschenberg, skinner, skinner auctions, Walker Evans by Skinner. Bookmark the permalink.